Flag of the City of London ( and the flag of the Red Cross? ). This emblem was depicted on the shields and tunics of the Knights Templar who also used the insignia of the Skull-and-Bones. 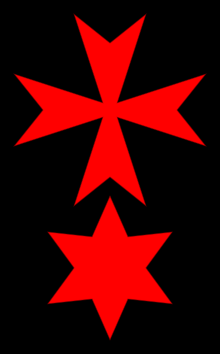 The Knights Hospitaller, who were chartered at the same time as the Templars, used an inverse (red field, white cross) version of the same design. A truncated-cross depiction of London’s flag is the Red Cross flag, identical to the inverted field of Switzerland’s flag. Are the flags telling us their heritage? The Hospitallers were a military organization and the largest (papally) chartered order to evolve from the Crusades. The central European chapters were mostly abandoned as the Hospitallers focused their resources in the Mediterranean, but regional groups took up their mission and created their own fraternities. This is the claim for the Knights of Bohemia, founded in Prague in 1233 by Princess Agnes. The Bohemians were also called The Dragon Knights and chose a red six-pointed star as their insignia, later placed below a Maltese Cross on their standard. The six-pointed star (of Solomon/star of David) adorns late medieval architecture and chateaux belonging to families who were likely members of this order, practitioners of alchemy and medicine in the larger complex of Crusades-era “corporations” that swore allegiance to the preservation of Jerusalem, the Holy Land. In the 1300s, the Hospitallers were forced to move their center to Rhodes, Sicily, and Malta respectively, while the seat of the pope was in France. The Hospitallers took on the mantle of policing the Mediterranean on behalf of “Christian” trade protection, although after the plague struck in the 1340s, the ensuing disorganization and loss of European wealth caused the seagoing Hospitallers to turn to piracy, directed against their historic enemies –Islam and the Turks– and in time as they contracted out naval services as mercenaries, against whomever their benefactors saw fit. Over the next two centuries, stabilization of trade and the navies to protect it led to the creation of merchant guilds, from where we get the Worshipful Companies and Societies. The words ‘merchant’, ‘mercenary’ and even the name “Merck” have roots in this seafaring activity. European Maritime law began its development from the time of the Crusades, distinct from its Near Eastern predecessors, based on the ‘privateering’ engaged in by the various Orders of Knights. A strange and curious fact about the founding of the Knights of Bohemia is that the year of its charter, 1233, corresponds to The Last Judgement which was to take place in that same year (technically at the end of 1232)according to Hebrew reckoning (in a lunar calendar system), derived from a belief that the World was to last 4900 years from the first year of Creation; designated as a formula of 10 X 490 from a Creation point in 3668 BCE; the number 10 representing 10 “world weeks” (each lasting 490 years) with a significant religious event marking the beginning of each world week. Calendrical revisions occurred several times in Hebrew dating calculations; differences between ’solar’ and ‘lunar’ reckoning made important distinctions in the various factions that marked internal divisions in Judaism and distinguished early Christianity as a ’solar’ cult. Was the lunar reckoning adopted by the Dragon Knights an indication of who they were? This brings up interesting questions about the Red Shield of the Rothschilds as apothecaries and traders in drugs and links to the Knights of Bohemia as a medical fraternity. The ‘red’ is perhaps from mercury ore, cinnabar, the chief material of alchemy, traded as a red powder. http://en.wikipedia.org/wiki/Mercury_(element) The Rothschilds acquired the Almaden mercury mines in Spain in 1835. The Roman god Mercury ruled over commerce, trade, and profit http://en.wikipedia.org/wiki/Mercury_(mythology), and carried the caduceus (or staff of Hermes-Mercury). Mercury was known to the ancient Chinese and was found in Egyptian tombs that date from 1500 BC. In China and Tibet, mercury use was thought to prolong life, heal fractures, and maintain generally good health. One of China’s emperors, Qín Shǐ Huáng Dì — allegedly buried in a tomb that contained rivers of flowing mercury on a model of the land he ruled, representative of the rivers of China — was killed by drinking a mercury and powdered jade mixture (causing liver failure, poisoning, and brain death) intended to give him eternal life. The ancient Greeks used mercury in ointments; the ancient Egyptians and the Romans used it in cosmetics which sometimes deformed the face. By 500 BC mercury was used to make amalgams with other metals. The Indian word for alchemy is Rasavātam which means “the way of mercury”. Hg is the modern chemical symbol for mercury. It comes from hydrargyrum, a Latinized form of the Greek word Ύδραργυρος (hydrargyros), which is a compound word meaning “water” and “silver” — since it is liquid, like water, and yet has a silvery metallic sheen. The element was named after the Roman god Mercury, known for speed and mobility. It is associated with the planet Mercury; the astrological symbol for the planet is also one of the alchemical symbols for the metal. Mercury is the only metal for which the alchemical planetary name became the common name. Is it apt to simplify the whole Satanic Agenda as “The Way of Mercury“? Religious practices from antiquity involved the ritual of drug-use which, as Terence McKenna writes, contributed to the vital chemistry of brain development. McKenna suggests that mushrooms elaborated our inherited religious cultures (and otherwise through ancient records, brought Krishna and Christ to our consiousness) and underlie the variety and relatedness we see in beliefs. It’s well known that the chemistry of diet determines our racial differences, and by extension, the chemistry of our drugs determines our psychological ones. If the “Way of Mercury/Satan” was the inheritance of the Dragon cultures that took root in the East and Mid-East, then the transfer of that ‘cult’ into (pre) medieval Europe evoked a change on our physiology –the alchemical transmutation– and bears the importance of the preservation of Bloodlines in a state of ‘becoming’; a repeat of an ancient practice meant to induce an affinity within one’s culture to a particular drug (or god). Documentarian Keith Thompson, who has a YouTube posting on the Illuminati, shows an image of a book cover for “The Rise of the House of Rothschild” depicting a shield-crest flanked by a Lion and Unicorn, matching the flag of Scotland that won its independence with the help of professonal Knights Templar who clandestinely regrouped in Scotland after destruction of their Order in France, c.1307. http://www.youtube.com/watch?v=eQMjr7-Gg20&feature=related. The unicorn was incorporated into the Scots Coat of Arms at about the same time as the Templars took refuge there, in the first decade of 1300 and may be significant to the Apothecaries emblem, established by James, the first Scot to sit on the English throne. Unicorn lore, while mixing many symbolic lineages, was an ancient lunar symbol and, as seen with the Lion, a potent reference for alchemy, merging the lunar and solar. Its horn was believed to neutralize poison and is an occult representation of the Sword, for the Brotherhood of the Sword; the medieval Dragon Knights. The Apothecaries crest merges these symbols with the image of Artemis the Archer (or Athena); virgin goddess of the hunt and sister “moon” to Apollo “sun” http://en.wikipedia.org/wiki/Artemis. Artemis is also a symbol of the Bow Star, Sirius, a deeply occult image of twinning that which is hidden. What is hidden by the coat of arms are the symbols of its lineage derived from its ‘twin’ Order, the Hospitallers of Malta and Bohemia. James VI of Scotland, who chartered the Worshipful Society of Apothecaries, is said to have established Freemasonry in England on the foundation begun by John Dee in the reign of Elizabeth. Dee, besides being the personal physician of the monarch, is credited as the author of Monas Hieroglyphica with developing the ‘hieroglyphic monad’, “which is at once a variant for the planet Mercury and also a composite sign..for all the seven planets.” (The New Jerusalem, Adrian Gilbert, p134). Gilbert adds that in the Elizabethan period, when the concept of British Israel appears to flower, the date of creation was also refigured by Archbishop Ussher to 4004 B.C. [p278] Adding 4900 years to this English version sets the Last Judgement to 896 A.D., initiating a millenium of ‘peace’ that ends with the advent of the 20th century, or precisely 1896. It’s conceivable to me that world events since this exact year are direct and secretive interventions in consolidating the esoteric traditions in a new composite (New Age). The Mercury dime* (with a ‘fasces’ on the reverse), 1916-1946, replaced the “seated Liberty” dime (with 13 six-pointed stars) in 1916 coincident with Wilson’s secret agreement to enter WWI and the first large US “polio” outbreak. Rockefeller’s medical establishment was elevated to its highest attainment of governmental influence by both WWI and polio, becoming the primary lab of the military. The Mercury was in use when FDR created the March of Dimes. A dime, or ‘one tenth’ took its name from a French word meaning ‘tithe’ (religious duty). The next change to the dime came in 1946 with Roosevelt on its face, the man who ushered the world into the Atomic Age under the auspices of the United Nations.